The cauldron is a symbol we find woven throughout Celtic mythology. It always seems someone either has a magickal cauldron, is trying to steal one, or is on a quest to find one. This past week at PantheaCon it was a symbol that kept popping up for me. Part of the Coru priesthood’s Four Treasures workshop was a guided meditation in which we worked with the energy of the four treasures of the Tuatha Dé Danann, one being the cauldron. In my own mediation both the cauldron and spear came through very strongly. I could see the spear in vivid detail, its wood carved with intricate knots (which had me inspired to pull out my wood burning tool as try making a ritual spear that looks like it! ), I felt draw to it, along with a need to hold it at the ready. For me it symbolized my journey on the warrior path. I also felt a strong pull toward the cauldron, which surprised me a little. I’m a girl who likes her swords, which is apparent to anyone who has seen the large number of them in my house. Part of me expected to be drawn in some way to the sword, but in the mediation it felt present but off in the shadows to me. The cauldron drew me in, it felt deep and vibrant, inviting me to hold it in my hands. The next day one of the workshops I was planning on attending filled up so I went to another one instead. Ironically enough it was about the Cauldron and the Grail by the lovely Vivianne Crowley. At the end of the workshop there was another guided meditation which started out fine until to put it mildly it got “hijacked”. In both my own practice and in teaching meditation and pathworking I find this can happen quite often. You start going through a guided landscape, then suddenly the pathworking/mediation takes on a life of its own. The instigator of said hijacked meditation was Dagda. So instead of continuing to listing to Vivianne’s voice, with it’s lovely accent, guide me, I followed Dagda into an earthen mound. You might think that as a Priestess of the Morrigan I would work with Dagda, as they are often linked in mythology. But I’ll admit he has never been a deity that came through very strongly to me in the past. It has always been Lugh and Cernunnos who called to me. But be that as it may there he was, a mixture of humor and jovialness with a kingly presence, beckoning me onward. Once in the mound he held up a copper cauldron and breathed upon its contents in a ritualistic manner. He held it out to me and said “Be a Power.” I use a capital “P” because that word had weight to it. Then I took the cauldron and drank from it, its liquid seeping into my bones, into my flesh, and into my spirit. Then Vivianne’s voice came back to me and I was being called back. What I find interesting about the cauldron is that while we think of it as an inherently feminine object, namely representing the womb, in Irish lore it’s almost always possessed by a male figure. We have Dagda and his cauldron that no host can leave without being satisfied and filled to contentment. The smith god Goibniu possessed a cauldron of healing, which could restore slain warriors to life. Lugh’s spear could only be soothed from its “battle furry” by being dipped in three cauldrons. What some would see as the ultimate symbol for femininity is almost always possessed by a male. In Welsh mythology the pattern continues. There is Bran and his cauldron of rebirth, and Arthur who quests for the cauldron in The Spoils of Annwn. Even the brew of the cauldron of Cerridwen, whose cauldron and its story we are perhaps the most familiar with, is made for a male (her son), then later stolen by another boy who transformed into Taliesin. I find there to be a nice symmetry to the idea of the masculine principle leading one to its polar opposite. In his article on the cauldron Michael Ragan (http://www.danann.org/library/symb/cauld.html) suggests that no one can possess the cauldron/grail and that it is not possessed by these male figured but protected and held in trust by them. Either way these male figured seem to be our initiators and guides to the mysteries of the cauldron. When it comes to Dagda’s cauldron I keep coming back to the lines from the Book of Invasions, “No company would go unsatisfied.” It does not say it produces a particular thing, only that it satisfies all who come to it. 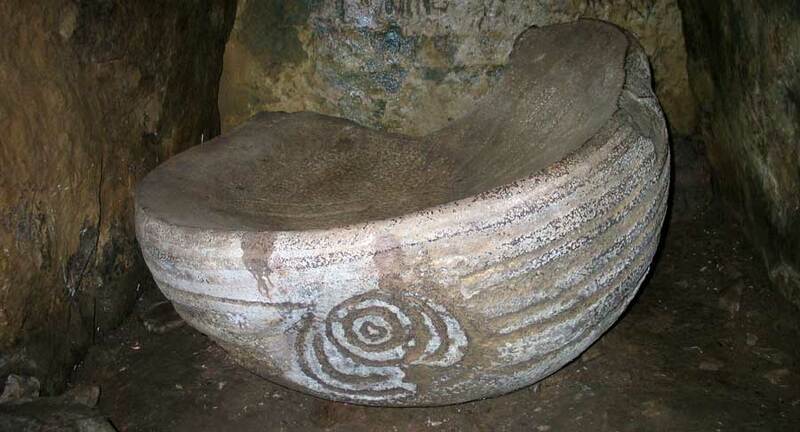 On one level it is the cauldron that provides for the people, a symbol of wealth and fertility. But on the spiritual level, it is the vessel that nourishes the soul. It shifts and changes and become what we need the most. We’ll see where this works takes me, but for now it seems I’ll continue onward where Dagda leads me. Should be an interesting journey.